Professional sports are an exciting part of life in Detroit. Thousands pour into the city throughout the year to cheer on their favorite Pistons and Red Wings, but few events bring fans into the city like the Detroit Tiger’s opening day. For passionate fans, opening day marks the unofficial start of spring, and is the celebration of a proud tradition honored by generations. Each spring baseball fans don the orange and blue, or the numbers of their favorite players and head to Comerica Park to fill up on hot dogs, bond with family and friends and cheer on the boys of summer. On Friday, April 8, take your place among the crowd while Justin Upton, Justin Verlander and Miguel Cabrera take the field against the New York Yankees. If you love the idea of getting a group together for opening day, but don’t want to handle the stress of traffic and hassle of parking, a charter bus rental is an ideal solution. Opening Day is the perfect corporate outing, community group event, school trip, or new family tradition. The ease of a charter bus rental guarantees that your group arrives together, safely and in style. 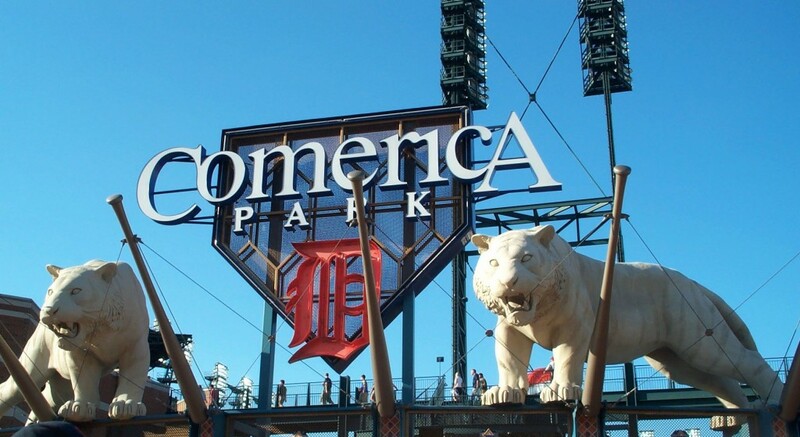 Enjoy safe, comfortable, round-trip transportation from the location of your choice to Comerica Park. Charter bus rentals are available in sizes to accommodate groups of most any size, and are more affordable than you may think. The cost of gasoline and parking fees for multiple vehicles, coupled with the added time and hassle of driving and bathroom breaks make renting a luxury touring coach an easy decision. Leave the driving to a professional while you and your guests enjoy impressive amenities that make travel a pleasure. Today’s charter bus rentals have comfortable seating, dinette tables, beverage centers, 110v convenience outlets, on-board restrooms, HD televisions, DVD players, theater sound and optional Wi-Fi allow you to relax and enjoy the excitement of game day. Your group will appreciate the convenience of USB ports that allow them to enjoy their favorite personal electronics, or take in a little sports radio. Opening day in Detroit brings an average crowd of over forty thousand people into the downtown area. Don’t take the chance of members of your group getting lost in the crush of traffic and missing out on the fun. Metro Motor Coach has a beautiful fleet of upscale touring coaches that is perfect for your opening day adventure or any outing. To take a closer look at any of our charter bus rentals visit our charter bus page here. Contact us today by calling 1.888.375.9666 or requesting a quote.